Romantic, Magical, - a step back in time! Our Access for All Carriage. There is something incredibly romantic about a Horse and Carriage. The slow glide of the carriage along the road, the metronome rhythm of the horse's hooves as we clip-clop along. Maybe its just the MAGIC of it all! Based in the historic village of Carrbridge, within the Cairngorm National Park, only 7 miles form Aviemore and half an hours drive from Inverness in the Highlands. Carrbridge Carriage Driving offers you a truly original experience. Come volunteer with us and be part of our team for up to 3 months! 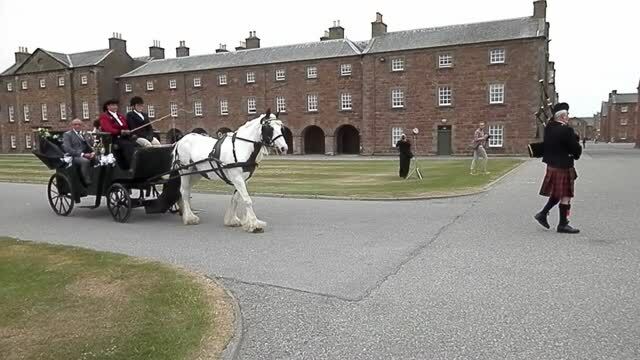 Practice your English, learn about carriage driving, horse care and management, and you'll also get a chance to see some of the most beautiful scenery in the Highlands of Scotland. Board and lodging provided. Evening drives by special arrangement. October till April - by prior arrangement only.